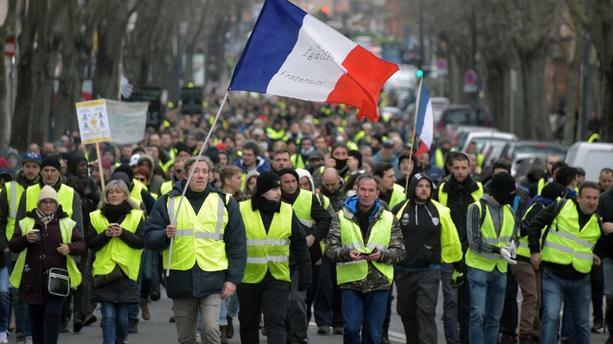 It is dispiriting spectacle to watch the cream of French intelligentsia argue for hours on TV the impact of a “Yellow Jackets” list on the outcome of the forthcoming European parliamentary elections. The entire focus is on the gains or losses such a list would inflict on established parties. The consensus is that President Macron would have most to gain and the extremes, especially on the right, would be weakened. Should the Yellow Jackets fail to run, as is likely, the far right (Le Pen and Dupont Agnan) is expected to make significant gains, severely beating the President’s supporters. However, this debate is secondary at best if not totally derisory when compared with the high stakes in play concerning the future of the EU. Nobody seems to give a thought to what the objectives of the Yellow Jackets might be or, put differently, what their (European) program might look like as well as the potential repercussions of their presence in the Assembly. If the Yellow Jackets wish to remain consistent with their credo to fight for improved purchasing power, greater social justice and a fairer distribution of wealth, the only justification of their participation in the polls should be the conviction that their aims are more likely to be satisfied in the long run at European rather than at national level. Arguments to defend such a point of view are not without merit. It could be based on a broader appeal of their movement, including similar groupings in Belgium and Portugal or to be created in other Member States in order to carry weight in the decisions taken by the Parliament. The enormous sympathy that the generated in France, which stretches far beyond the numbers of active demonstrators, should, in theory, offer an option to the voter (particularly to those who regularly abstain) to escape the choice between: on the one hand, the straightjacket of a “rules” based Union defended by traditional Europhile parties and, on the other hand, the support of extremists that are surfing on popular discontent to promote their agenda of dismantling the Union, (which was rejected 18 months ago by a large majority of Frenchmen). This third option offers President Macron the opportunity to reaffirm his objective of reinforcing the Union aiming for a “Union that protects”, economically, socially and militarily because – rather than in spite of – of the pressure he is under from French public opinion. This would be an audacious gamble at a time when he finds himself more isolated domestically and internationally. However it also reflects an inescapable truth: the objectives of the Yellow Jackets will not be achieved within the context of dismantling the Union and the €. The implosion of the EU implies weathering a period of severe crisis which will be deeper as the result of our total interdependence, whether we are conscious of it or not. If, on the other hand, a significant segment of Yellow Jackets believe that “FREXIT” is an integral part of the response to their demands, then they should have no interest in presenting candidates to the European elections; they would be far more effective swelling the ranks of the lists of the far right, from which many emanate, in order to reach their aims. Indeed, it is clear that searching for a purely “national” solution to their demands would, if met, come up against the European rules as was shown in the recent Italian budgetary showdown. That is why it is necessary to add at least one important subject to the four proposed by President Macron in the forthcoming “national citizen’s debate” covering “The European Union for what purpose? And, the place of France in the EU”. It is only by taking into account the “European dimension” of many of the challenges to be faced that one can avoid fostering an introverted mentality that induces xenophobic, anti-Semitic, homophobic, etc. tendencies spreading the shunning and hatred of “others” and leading inexorably to authoritarian regimes at the opposite of the ideals of “liberty, fraternity and equality” for which France so proudly and rightfully stands. The popular support for the Yellow Jackets is a warning shot – currently peaceful – which compels the body politic to reassess itself from top to bottom. Confidence in “democracy” must be restored through profound behavioral changes (and where necessary, institutional ones) both in France and at European level. The European elections create a unique opportunity to reinvigorate the spirit of collective solidarity and responsibility that has presided over 70 years of peace between its Members, a not insignificant achievement. “Inexorably reinforcing our vassalization”, be it to the dictates of the US Dollar or the imperialist ambitions of new major powers. More than ever the ideas propagated by the Yellow Jackets and the stakes of the European elections are closely linked. Next May, every citizen will be called to exercise his responsibility as an elector and to fully accept the verdict of the poll.